Tell us about yourself: Active duty military currently considering getting a Dutch Shepherd. Hi, I am a active duty soldier stationed out of ft hood, tx. Currently in the process of looking for a dutch shepherd breeder. I am married with a 1 year old daughter, trying to find a dog that will be a good mix of family dog/protection dog. I have never had a dutch shepherd before, but grew up with Bernese mountain dogs and trained my Shetland sheepdog in agility and obedience. My most recent dog was a 10 year old american bulldog that just passed away last month. Not looking to buy a dog until i get home from deployment in roughly 9 months but would love to get on a waitlist. If you have any tips send me a message. First...............Thank you for your service !! What are you looking for as far as for what the dog will do as a family dog and what do you want it to do as a protection dog? Will you be going back on deployment ? What will you be doing for work when you are back, will the dog be staying home with your wife? does your wife have dog exp? This breed is not really a family dog, it is really meant for heavy work,such as police work or Ring sport or many of the other sports. They are used to being worked and trained all day. They will bond to one human tightly, so if that is you and you leave, your wife may have a hard time gaining the respect of the dog. You also want to make sure your daughter learns that this is not a play toy ( no disrespect) THey do not like hugs, pokes, and the like. Now, many of the dogs here, will take hugs, and snuggles, but be warned. My Sadie hates physical contact, but my Thalie is fine. This is a whole different breed than anything out there. 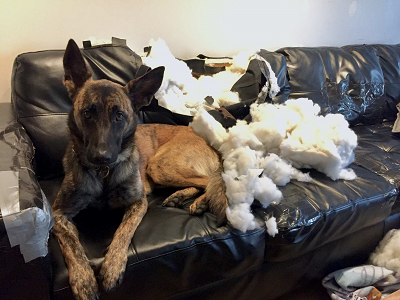 Awesome questions, I would say that the Dutch Shepherd will indeed be great for you if the answer to all these questions permits. If you are going back to deployment, take dutchringgirls advice that these dogs breed very much to one person. You may be looking for that, I know I was. Also, I agree that mine isn't all cuddles and that's probably because I never really asked him to be either. Thank you for your service. Best wishes to you and your family as you look for your newest family member. Also, I agree that mine isn't all cuddles and that's probably because I never really asked him to be either.